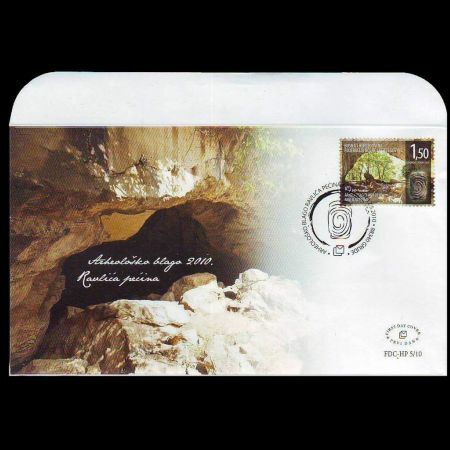 Bosnia and Herzogovin 2010 "Archeological treasure - Ravlica cave"
Issuing Authority Croatian Post Ltd. 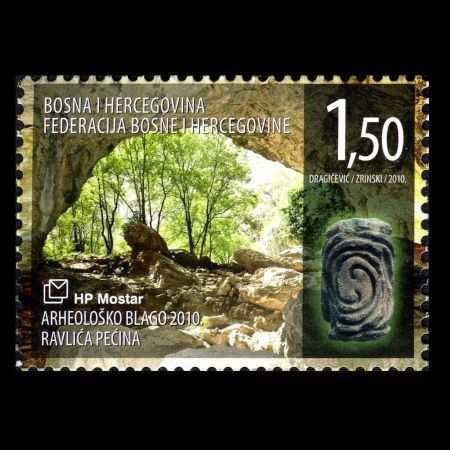 The Ravlica cave in the Pec Mlini, at the source of the river Tihaljina near Drinovci, (western Herzegovina) is one of the most important prehistoric sites in Bosnia and Herzegovina. By excavations, which were conducted from 1977. 1979. at that site, and again from 2008. 2009., it was determined that the cave served as a living space for a large number of prehistoric communities from the early Neolithic until the middle Bronze Age or during the entire time span from around 5700. BC until around 1500. BC. During the excavations the numerous remains of ceramic pottery, flint, stone and bone tools were found as well as grindstones for grinding the corns, palettes for grinding the paint used for painting pottery, remains of prehistoric fauna which was grown and hunted by residents of Ravlica cave, and many fireplaces with thick layers of ash and burned wood. Neolithic until middle Bronze Age, at the wider eastern Adriatic coast and its hinterland. Among archeological founds discovered during archeological excavations, in particular, stands out ceramic pintadera, cylindrical shape object derived with a plastic spiral motifs, which belongs to Hvar-Lisicici culture from the late Neolithic and it is the only found of that kind from the late Neolithic in the entire area of the eastern Adriatic coast. In a functional sense it is probably an instrument by which the pigmented spiral pattern is transmitted and reproduced to other media, especially on fabric. 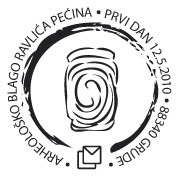 (Prof. dr. sc Brunislav Marijanovic) Croatian post d.o.o. 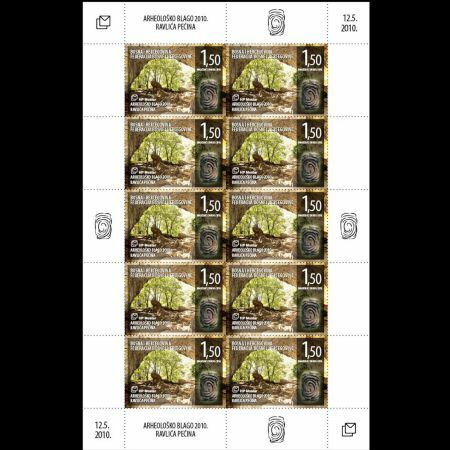 Mostar has issued regular postage stamp in the sheet of 10 stamps, postmark and the first day cover. 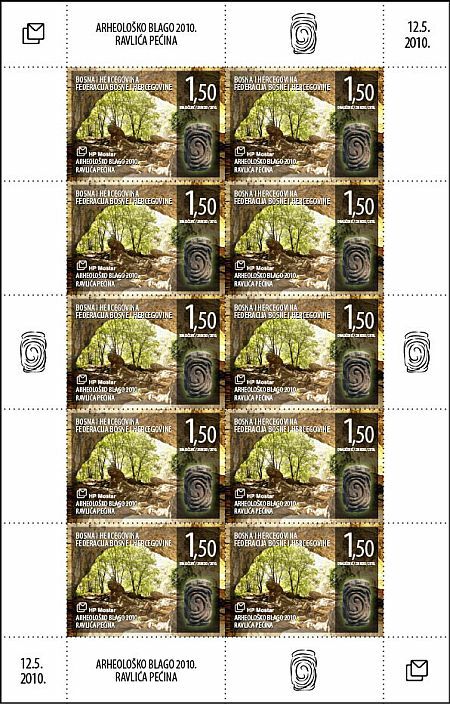 The author of pintadera photo, shown on the postage stamp, is Prof. dr. sc. Brunislav Marijanovic.